Look how far we have run to! As you know we were recently given the challenge of running the equivalent of the Pennine Way by Andy Mouncey who was trying to complete the Spine Race. The children readily accepted this challenge and have been running ever since! 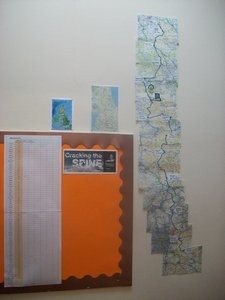 Our display shows where the Pennines are found and the route that Andy and the other runners were following. After our first whole school afternoon of running we had arrived at Swaledale, which is about halfway between Check Point 2 at Hawes and Tan Hill, just on the top edge of the Yorkshire Dales. After some superb running from Emily B, Sam I, Jessica, Bryn, Eva, Dylan and Martha, outside of school hours, we have now overtaken Andy and have run 191.5 miles! 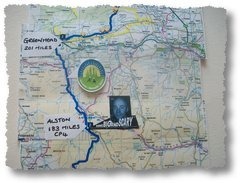 We are just 9.5 miles short of the Greenhead checkpoint which is at the start of Hadrian’s Wall. Wow! If you have been doing some running and have more miles to add to the whole school total, please just fill in the form on the front page of the website, marked ‘Running’. Keep going everyone! Posted on January 27, 2014, in General Information. Bookmark the permalink. Leave a comment.